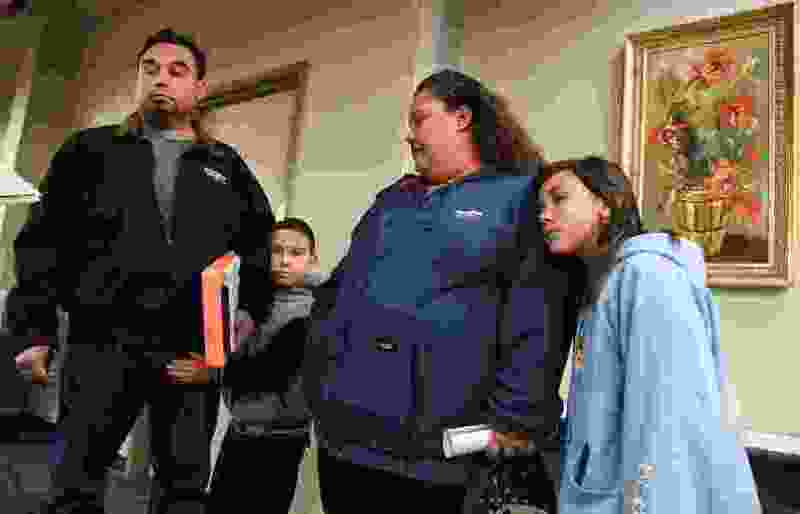 (Francisco Kjolseth | The Salt Lake Tribune) Cesar Reyes and his wife Carmen Ramirez express their dismay at the closure announcement of Oquirrh Hills Elementary in Kearns where their children Julio, 7, and Gabriela Reyes, 10, attend school. The Granite School District Board of Education held a public hearing on Jan. 8, 2019, at the Granite Education Center in Salt Lake City where they decided to close the school due poor performance since 2015. When Granite School District’s leaders voted to close one of the worst-performing elementary schools in the state this year, many in the surrounding westside community were disheartened and resentful. They didn’t think it was fair to the students. They said they felt the largely nonwhite population in their Kearns neighborhood was being targeted. They questioned whether it had anything to do with the low household incomes of the kids who attend classes there. Now, a state senator is proposing a change that would require districts and boards of the lowest-performing schools — identified by Utah’s turnaround program as needing to improve their test scores or face possible closure — to inform their communities at least 120 days before a decision is made to shutter or change boundaries. SB245, made public this week, was one of the most anticipated education measures of the session, though it’s unclear how far it will get with four days left for it to pass. It gained initial approval in the Senate Education Committee on Friday with a 5-1 vote and and little discussion. It will move to the Senate floor next for consideration. The bill would have all schools, including charters, provide initial notice to parents, teachers and residents when a school is designated as turnaround, as well as annual updates on how it is doing in the program. The district school board would also be required to hold at least two public meetings to discuss any proposed changes. When the turnaround program was created in 2015, the failing status was applied to the 3 percent of Utah campuses with the lowest school grades. Once designated, schools have three years to either improve their standardized test scores and grades or face consequences, such as being required to shut down, redraw boundaries or purge faculty. The law was amended in 2017 to make it slightly less harsh. Now, a school must be in the bottom 3 percent for two consecutive years. Granite School District’s board of education voted to close Oquirrh Hills Elementary, which was named in the first cohort and didn’t improve in time, rather than face further sanctions. Another in Salt Lake City, Bennion Elementary, is also being discussed for closure. Kearns Metro Township Mayor Kelly Bush, who criticized the Granite board for not better informing the community, said Friday that she believes the bill will add transparency to the process. Granite spokesman Ben Horsley said the district is aware of the bill and supports it. Already, he added, the administrators there want to do more to inform the public. There was a community meeting in December where parents could raise their concerns before the board decision; and notice went out with students 10 days before. Still, he said, it wasn’t enough.